Twinkle spontaneously bleeds from her eyes as well as her head, hands and other body parts -- though there is no visible source or injury to explain it. Some say a bad omen has been cast, others think she is possessed, and yet others think it could be self-inflicted. Hoping for a breakthrough, Twinkle and her mother put their faith in a top American blood specialist who is flying to India to investigate her extraordinary case. THIS is the girl who has baffled top doctors because she spontaneously BLEEDS from her pores up to 50 TIMES a day. 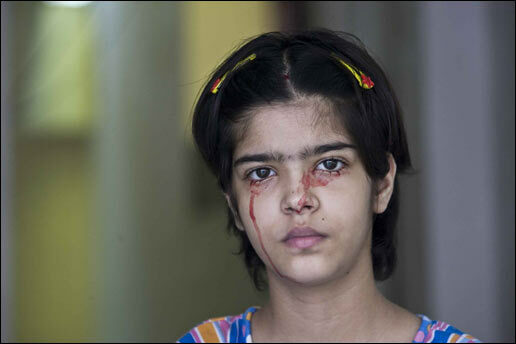 Twinkle Dwivedi, 14, has strange disorder which means she loses blood through her skin without being cut or scratched. Terrified Twinkle has even undergone transfusions after pints of it seeped through her eyes, nose, hairline, neck and soles of her feet.